London Chess Classic has started today. Nine GMs, four of them are top-listed in the world rating, will compete in “football” alike scoring system: win – 3 points, draw – 1, loss – 0. Here’s the Magnificent Nine: Magnus Carlsen (Norway, 2826), Viswanathan Anand (India, 2811), Levon Aronian (Armenia, 2802), Vladimir Kramnik (Russia, 2800), Hikaru Nakamura (USA, 2758), Michael Adams (England, 2698), Nigel Short (England, 2698), Luke McShane (England, 2698), David Howell (England, 2633). You probably remember that recently Carlsen, Aronian, Anand and Kramnik competed in another tournament, Tal Memorial, which means they didn’t have much time to rest from each other. Yesterday GMs played an entertaining game against Internet users, it’s not hard to guess who won. Results can be followed live on the main page of our website. Today we’re going to discuss the first round events on the air of our radio (works from 18:00 MSK Time). Besides the major tournament the festival includes an open competition and round-robin tournament among women. A distinguished guest of the festival is Viktor Korchnoi. Visit the official website for the details. A chaotic face-off Kramnik – Carlsen of Round 3 finished in a draw. Carlsen’s was unsuccessful from the opening which gave Kramnik an obvious advantage. Good was, for instance, 20.Qg4. A new November rating list has been published today on the official website of FIDE. 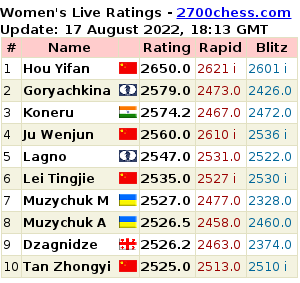 It turned out that for the first time in history of chess at the same time four Grandmasters went over the cherished 2800. 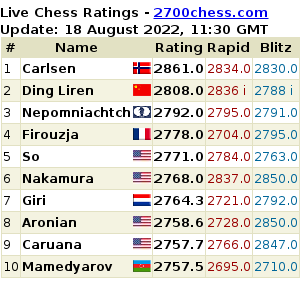 Among these four are: Carlsen Magnus (Norway, 2826), Anand Viswanathan (India, 2811), Aronian Levon (Armenia, 2802), Kramnik Vladimir (Russia, 2800). That was February of this year when we reported about the legendary Yugoslavian GM Svetozar Gligorich to release his first musical album at the age of 88. Levon Aronian Called Chess "A Game of Egoists"
Journalists continue trying to understand what is going on in the strongest Grandmasters' heads. We offer you a part of Levon Aronian's interview to "Yerevan" magazine.